How to find a 2D coordinate field's corners in a 3D Coordinate field if I have 3x 3D points with 3x2D Points? 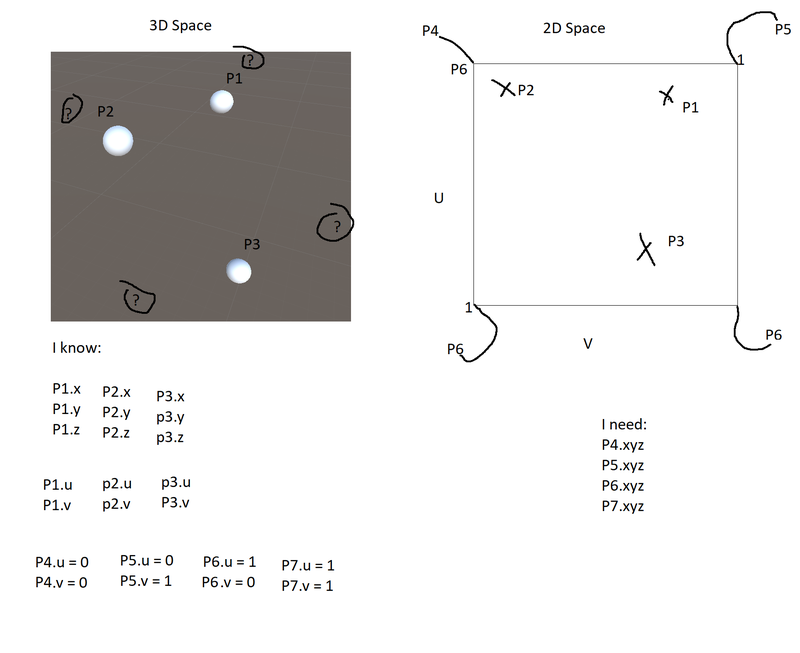 In order to solve "this" problem, i have to transform my corner-points from a 2D Space to my 3D Space. The simplest transformation between the two coordinate systems, and the one I suspect you’ve got in mind, is an affine map. It’s convenient to work in homogeneous coordinates, which allows this map to be represented by a $4\times3$ matrix $M$. I’ll use lower-case letters for points in the 2-D $u$-$v$ coordinate system and upper-case for points in the 3-D coordinate system to avoid ambiguity. The images of the corners of the 2-D unit square are then found by multiplying their homogeneous coordinate vectors by $M$, but the results will be simple combinations of the columns of $M$: $$(0,0) \mapsto M_3 \\ (1,0) \mapsto M_1+M_3 \\ (0,1) \mapsto M_2+M_3 \\ (1,1) \mapsto M_1+M_2+M_3.$$ You need to dehomogenize, of course, but if you’ve done this correctly, the last coordinate will always be $1$, so all you need to do to get the corresponding inhomogeneous Cartesian coordinates is to drop it. † In fact, in practice you can drop the last row of $M$ so that you get dehomogenized coordinates directly when you multiply a homogeneous coordinate vector by $M$. If the last element of the homogeneous coordinate vector $\mathbf p$ is $1$, then so will be the last element of $M\mathbf p$, and dehomogenizing the result is a matter of dropping this $1$, as noted elsewhere. Not the answer you're looking for? Browse other questions tagged coordinate-systems transformation affine-geometry or ask your own question. How to determine the position of neighbor points? How to know if two points are diagonally aligned?